Confessions of a sports bigamist. Photo by Rich Schultz/Getty Images. The most exciting play in Saturday’s Giants-Jets game arrived late in the second quarter, with the Giants losing 7-3 and pinned at their own 1-yard-line. One of the league’s best offenses had been stalling all day, but on third down with 10 to go, Eli Manning took the snap deep in the end zone and lined a pass to Victor Cruz on the right side. Cruz broke free of one tackle, slipped another, and then hoofed up the sideline, leaping another defender at midfield on his way to a 99-yard touchdown. A guy sitting next to me at the bar sprang out of his seat, Phil McConkey jersey flapping, and high-fived his girlfriend. The Giants never trailed again. The most miserable play in Saturday’s Jets-Giants game arrived late in the second quarter, with the Jets up 7-3 and the Giants pinned at the 1-yard-line. One of the league’s worst offenses had found a way to control the game, holding the ball for most of the first half and now licking their chops at an end-zone punt. But on a long third-down, the Jets pass rush showed up a few steps too late; Kyle Wilson lost his receiver at the 11-yard-line; Antonio Cromartie missed a tackle so badly that he fell to his knees; and safety Eric Smith gave one final, flailing try to save the season—and slid face-first into the Jets sideline. A guy in a Sanchez jersey leaned back on his stool. He did not high-five anyone. I stayed in my corner of the bar, avoiding eye contact. I couldn’t cheer but wouldn’t pout. Joy and pain mingled in my chest, and coagulated into nausea. You see, I’m a Giants fan—always have been and always will be. Eli Manning and David Tyree gave me the greatest moment of my sports-watching life. (Also in the top ten: Scott Norwood’s shanked field goal in Super Bowl XXV.) But my favorite player, growing up, was the twinkle-toed Jets running back Freeman McNeil. That’s because I’m a Jets fan, too—now and forever, come hell or high water. This is embarrassing, I know. You can’t like both the Giants and the Jets, any more than you can be a fan of the Cubs and the White Sox, or the Clippers and the Lakers. 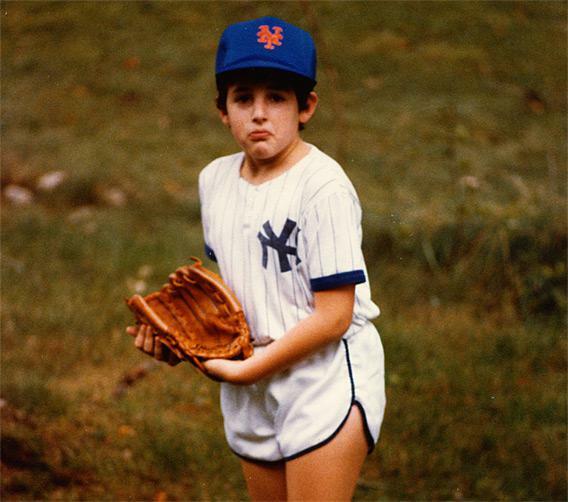 That’s why I’ve kept my unnatural urges—to root for the Giants and pull for the Jets—hidden for so many years. In this space, just a few weeks ago, I identified myself (not inaccurately) as a long-suffering Jets fan. I did the same back in October. But never did I acknowledge my divided loyalties. I’ve pretended a single-minded fandom in bars and on couches, in trash-talking text-messages to my friend Luke. I’m on an email list devoted to anguished debates over the state of the Jets’ offensive line, injured nose tackles and safeties, and obscure playoff scenarios. I’ve lied to all these people. Luke, Bill, Dan, Chris, Mary, Melissa—I’m sorry. I’ve been leading a double life, checking Giants blogs behind your backs, obsessing in private over the state of Mario Manningham’s knee. (He’s optimistic, by the way, about Sunday’s game.) But it’s time for me to let my sports-world bigamy come to light. It’s time to voice my secret shame: I am a flip-flopper, a quisling, a fink. And now that I’ve stepped out of the closet, let me defend myself. Like all paraphilias, mine derives from childhood; like all paraphiliacs, I blame my parents. My father grew up next to Yankee Stadium, with the ballpark lights shining through his bedroom window. The players used to eat breakfast at a drugstore on Walton Avenue, run by my great-uncle Lenny, but the Engbers managed to escape the South Bronx without an iota of baseball fandom, or any other sports identity that could be passed down the family line. My mother, meanwhile, came from Brooklyn, a short ride from Ebbets Field. She remembers being at the ‘55 World Series, but whatever enthusiasm she once had was gone from our genome by the time the Dodgers moved away. My parents met in Manhattan, and my brother and I were their anchor babies on a borough of compromise—fourth-generation New Yorkers, descended from tailors and capmakers, but without a sports-team legacy of our own. As a baseball-card-collecting, stats-memorizing, sports-obsessed nerdling, I was as befuddled and adrift as my great grandparents had been on the shores of Ellis Island. Here I am in the early ‘80s, on the back lawn of my grandparents’ house, and lost in the wilderness. It’s a troubling photo. Untutored and confused, it took the onset of puberty—and the arrival of Darryl and Doc—to make me into a full-grown fan. Choosing the Mets, and thus hating the Yankees, started as a convenience but ended as a kind of politics—an alignment with liberals and Jews and life in the outer boroughs, and a rejection of the plutocrats and carpetbaggers who ran the city from downtown. I might have adopted the Jets for the same reason: They shared a stadium in Queens, and seemed equal parts of the sports counterculture. The Mets and the Jets, the Jets and the Mets—it would have made sense, but it never took. Maybe that’s because no one made me choose. There aren’t enough hours in the day to watch two baseball teams all season long, nor is it feasible to memorize the details of two complete 25-man rosters. But there are no such limitations to following the NFL. The Giants and the Jets never play in overlapping time slots, except for the quadrennial event of their going head-to-head. I could and did watch both teams every week, in a six-hour block of indiscriminate, home-town rooting. It sounds like a cheat—a way of hedging my bets. But in practice it’s more like doubling down. It’s always nice to see the Giants win, but I always know the feeling can be wiped away a few hours later, by a single bad throw from Mark Sanchez. For the last few years, my teams have made a ritual of canceling each other out in mirror-image seasons, with the Jets going on late runs to the conference championship game as the Giants suffer a humiliating collapse. And when both teams lose crucial games—think of two weeks ago—I’ve wasted twice as much of my weekend, and ended up twice as disappointed, as everyone else. What about Saturday’s game? The dramatic outcome was never really in question—after all, someone was going to win and someone was going to lose—but I couldn’t tell if all that would make the game feel like comedy or tragedy. It was neither. Watching with all the blues and greens, I was as mixed up as I’d been in my Yankees shirt and Mets hat. Every bad call was a relief and an outrage, every play was both smart and boneheaded, every sharp pass doubled as a blown coverage. Not sure what to think, or how to watch, I only found my bearings halfway through the fourth quarter and after a couple of Turbodogs, when the two teams combined (or maybe it’s better to say collaborated) for a six-minute stretch of no-I’m-the-dummy football that would be a fitting capstone to both their seasons. Defending a fourth-down play from midfield, up by a score of 20-7, the Giants managed to get called for a long pass-interference. The Jets took advantage two plays later with a touchdown catch by Plaxico Burress, only to have it called back for offensive pass interference. Sanchez got sacked and fumbled on the next play, but that call was reversed upon review, after which the Giants gave up another fourth-down conversion, and then, after that, Sanchez fumbled again—this time for real—into the end zone for a touchback. The Giants took over at their 20, with nine minutes left in the game and ready to start eating up clock. They decided to pass on first down—a surprise move that was altogether unsurprising in its outcome: Hakeem Nicks did what the Giants receivers have made their specialty, batting a decent pass into the arms of a defender. Given the ball once more, Mark Sanchez proceeded to fumble the ball once more—although that, too, was called an incomplete pass upon review. Backed into a third-and-12, with the game more or less on the line, the Giants came to the rescue with yet another penalty, setting up a Jets touchdown from the goal line. When the Giants went an ugly three-and-out off the ensuing kickoff, and the Jets did the same a minute later, I knew everything would be OK. Both my teams were playing their hearts out, sloppily and in character, ready to give the game away and ready to save it, too. Whatever happened on the field, I knew they’d both figure out a way to win and lose. Go teams.